We are currently editing 124 articles since 5 July, 2005. 15 June 2015: Katherine Waterston is cast as Porpentina Scamander in the Fantastic Beasts and Where to Find Them trilogy. 1 June 2015: Eddie Redmayne is cast as Newton Scamander in the Fantastic Beasts and Where to Find Them trilogy. 30 July - 2 August, 2015: GeekyCon (formerly known as LeakyCon) will be held in Orlando, Florida. 4 April, 2015: Harry Potter: The Exhibition will be open at Cité du Cinéma in Paris, France. 19 March, 2015: The Making of Harry Potter adds The Hogwarts Express and Platform 9¾ to the tour. The Bloody Baron (late 10th century — early 11th century) was a wizard who attended Hogwarts School of Witchcraft and Wizardry in the Founders' time and was Sorted into Slytherin house. After Hogwarts, he fell in love with Helena Ravenclaw, but she did not love him. He was sent by Rowena Ravenclaw to find Helena in Albania, but Helena refused to return with him and so he killed her in a rage. When he realised what he had done, the Baron stabbed himself with the same knife and died. Since then, he is one of the ghosts that haunts Hogwarts School of Witchcraft and Wizardry, and the ghost of Slytherin house. 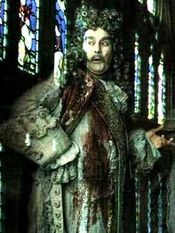 Covered in Helena Ravenclaw's blood to this day, he earned himself the moniker of the "Bloody Baron". ...that Rubeus Hagrid was 62 in Harry Potter's first year at Hogwarts? ...that Albus Dumbledore's favourite kind of jam is raspberry? ...Peeves's hat with bells was custom-made in 1876 by Madame Bonhabille of Paris by request of Headmistress Eupraxia Mole, who was trying to compensate the Poltergeist after the caretaker of the day tried to get rid of him? ...that when Severus Snape substituted for Remus Lupin in Harry's third year Defence Against the Dark Arts class, he said that Kappas are from Mongolia when they are actually from Japan? ...that there are one hundred and forty-two staircases in Hogwarts School of Witchcraft and Wizardry? "Harry Potter and the Goblet of Fire" is currently featured on Pottermore. Which of these characters, featured in this book, are you particularly eager to potentially learn more about? 4 votes have been cast since the poll was created on 14:02, 18 August 2015. This page was last edited on 13 May 2018, at 08:09. This text is available under the GNU FDL and may have been adapted from the Wikipedia article about Main Page (history).